Today I visited the the UNESCO World Heritage Site named Sefa Utaki in Okinawa, Japan. It was one of the best photography days I've had in a long time and I'll probably keep every image that came out of my camera. 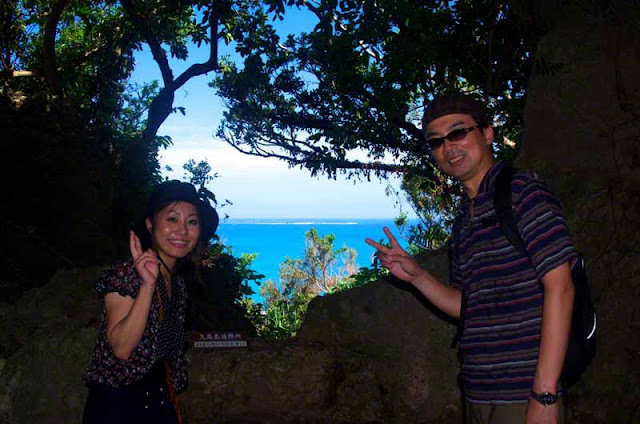 This photo is of a couple, Hiroshi and Natsumi who were visiting from Tokyo. They smiled and gave the peace symbol not knowing how that drives foreign cameramen, like me, nuts. But, they were friendly and complimented my photography so, I emailed them a file of this picture large enough to print. Probably for the past five years, whether it was a weekday or a weekend, every time I have visited this site it has been impossible to catch the island in the background under clear skies. Barely visible, in the center of this photo, is Kudaka Jima. That is the island Okinawans believe their ancestors came from. Catching it in this light was a dream come true for me and made it one of the best Wednesdays in my life. Once I captured my fill of photos and headed back down the trail I smiled at everybody flipping peace symbols at cameras. Hiroshi and Natsumi thanks for posing and I hope you enjoyed your stay. Visit Okinawa again, sometime and I'll pose and let you snap a picture of me flipping the peace symbol wherever you'd like !